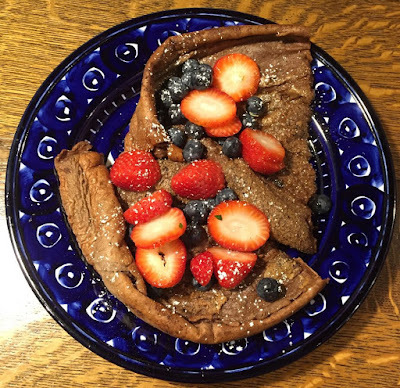 Chocolate Dutch Baby with strawberries, blueberries, and powdered sugar. 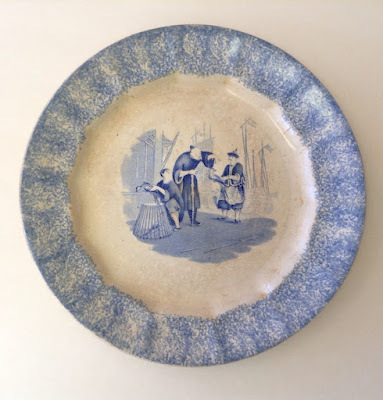 *I know this plate isn't transferware, so see the bottom of this post. Three things were new to me in January 1977: a husband, a kitchen, and a Dutch Baby. Not a human baby, he came later, but a buttery, fluffy, huge pancake that was gorgeous to look at (for a minute before it deflated) and delicious to eat. The recipe arrived by mail in the January 1977 issue of Sunset Magazine. I liked the Dutch Baby so much that I think made it nearly every week for 10 years, and then I didn't. 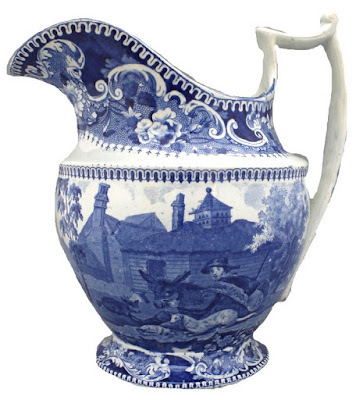 My kitchen grew old and my children complained. They wanted meat! Recently, two things happened. I remodeled my kitchen! And, a recipe for a Chocolate Dutch Baby arrived by email from the superb cooking blog, Smitten Kitchen. 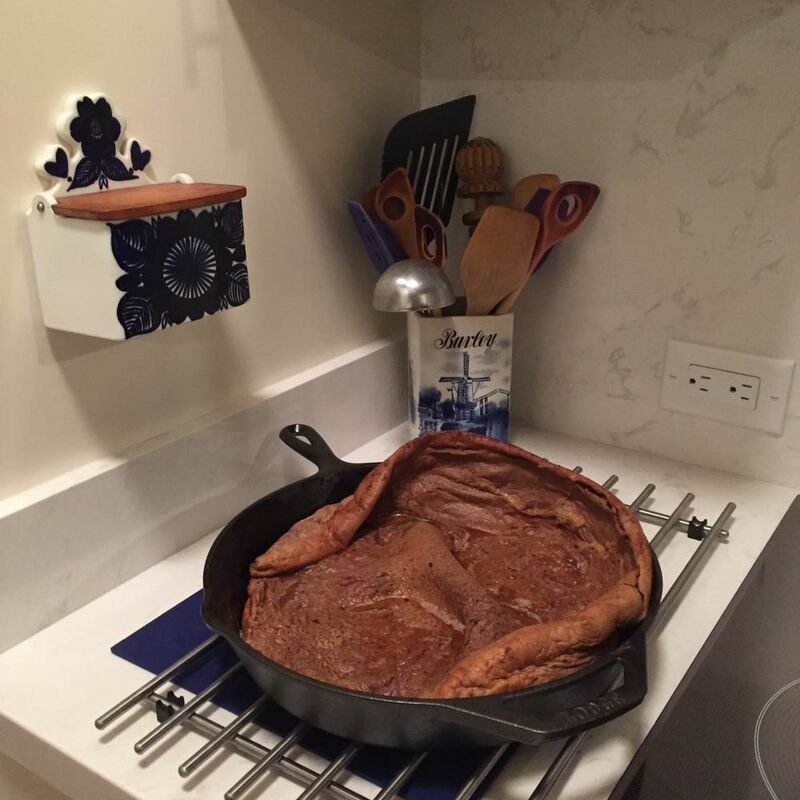 I had never thought of adding chocolate to a Dutch Baby. It seemed perfect without it. But I tried it and loved it, so I thought I'd share the recipe. Smitten Kitchen's Chocolate Dutch Baby January 17, 2017. You'll get more information from the link, but I added some of my ideas here. Shaved dark chocolate and powdered sugar (to finish) I skipped the extra chocolate, but I did use the powdered sugar. Fresh berries and syrup (to serve, if desired) I used blueberries and strawberries, but no syrup. Whisk (I haven't used my circa 1960s whisk in years) eggs, sugar and salt in the bottom of a medium bowl. I actually used the largest of my 1970s Pyrex bowls because I am a messy mixer. Add flour and cocoa, whisking until mostly smooth (some tiny lumps are okay, but whisk out what you can). Drizzle in milk, whisking the whole time. Heat a 12-inch ovenproof skillet on the stove over high heat. Add butter and melt, tipping the pan around so it butters the sides too. Turn heat off and scrape batter into the pan. Transfer skillet to the oven and bake for 16 to 18 minutes, until pancake is billowy. Just like my old Dutch Babies, the pancake deflates quickly. 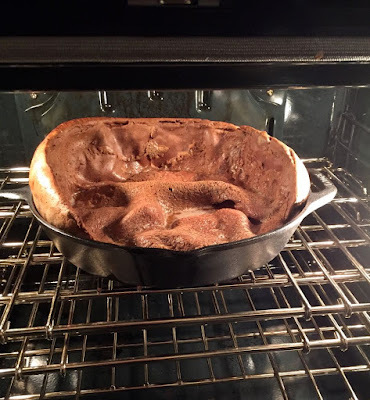 This half of the Dutch Baby held its shape better than the half on the plate at the top of this post. 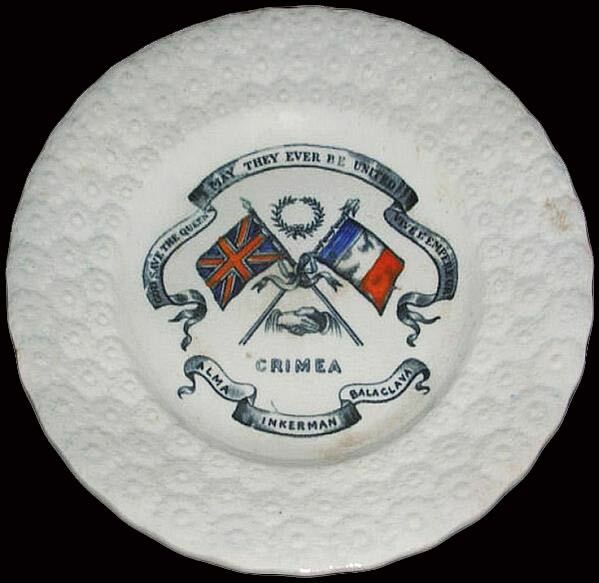 The plate is decorated with the hand-painted "Valencia" pattern made by Arabia in Finland, ca. 1960. 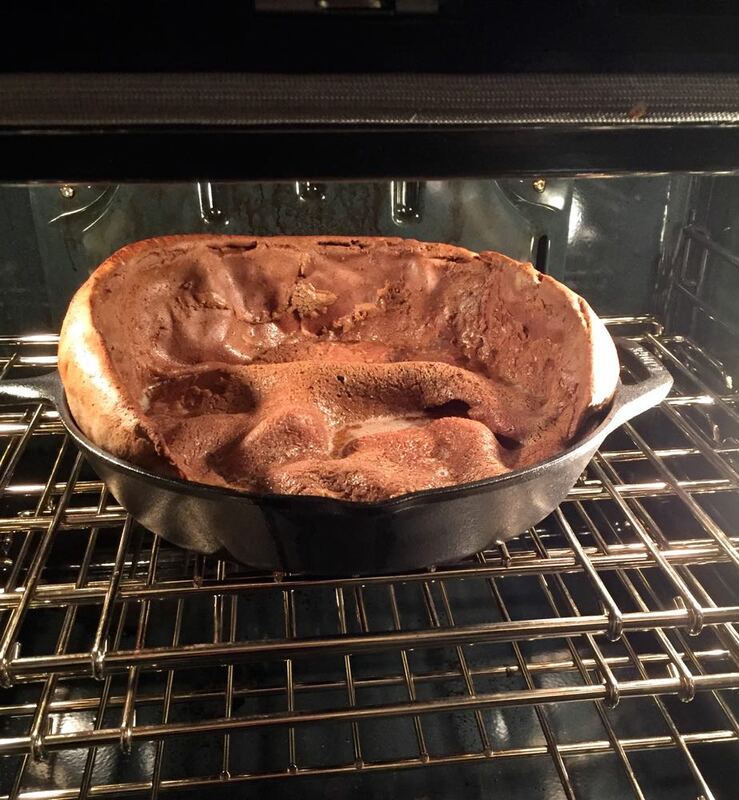 Here are some of my Chocolate Dutch Baby thoughts. Despite its sweet sounding name, it is not that sweet. I suggest using the shaved chocolate and the syrup if you have a sweet tooth. 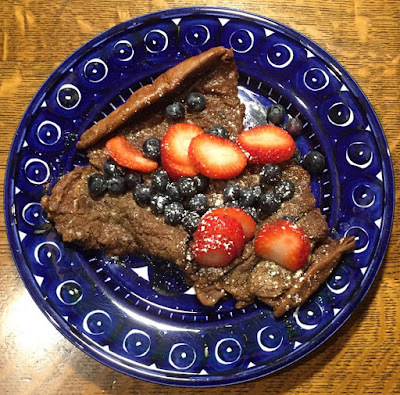 If you want a light chocolate pancake to enhance you fruit experience (I did), than leave out the extra sweets. One more thing. 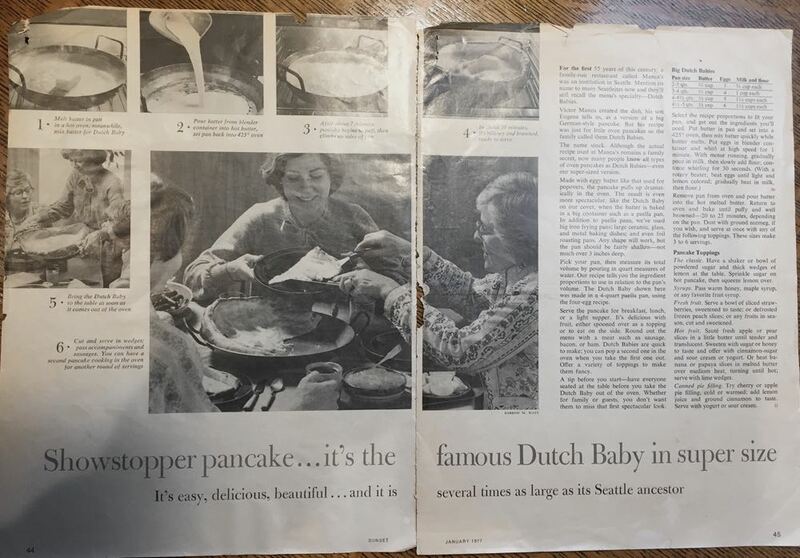 Here is the original Dutch Baby recipe from 1977. I always tore out my favorite Sunset recipes and put them in a folder. I am so glad I saved them! 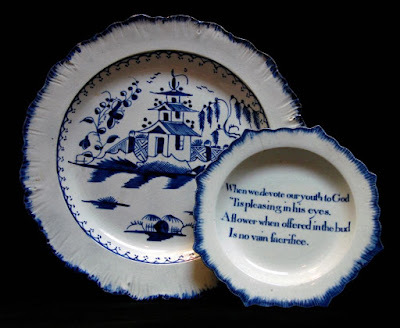 I know it's too small to read, so below I present the recipe for the large version Dutch Baby. 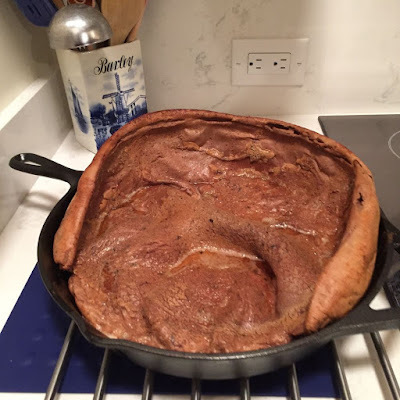 I always made the largest Dutch Baby (there are different sizes). Pan Size: 4-1/2 - 5 quarts - I used a 14.5 inch paella pan. Put the butter in the pan and set in the oven. Mix the batter quickly while the butter melts (I always had the mixture ready before I did this). Put eggs in a blender, and whirl at high speed for about 1 minute. With motor running, gradually pour in milk, then slowly add flour, and continue to whirl for about 30 seconds more. It is so easy to do in a blender! This is when I put the pan in the oven and melt the butter. When butter is melted, remove the pan from the oven and pour the batter into the hot melted butter. Use your favorite topping. Perhaps chocolate? *Actually, I should have plated the Dutch Baby on a transferware plate, but I didn't. 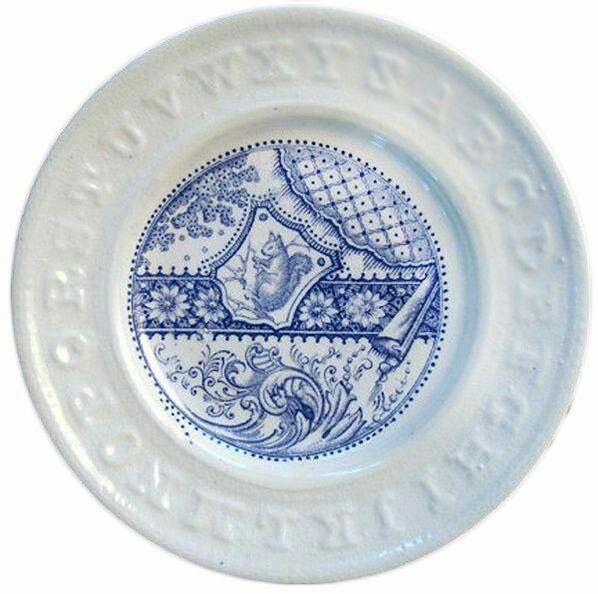 The Dutch Baby would have looked beautiful on any of my transferware plates. Or yours. 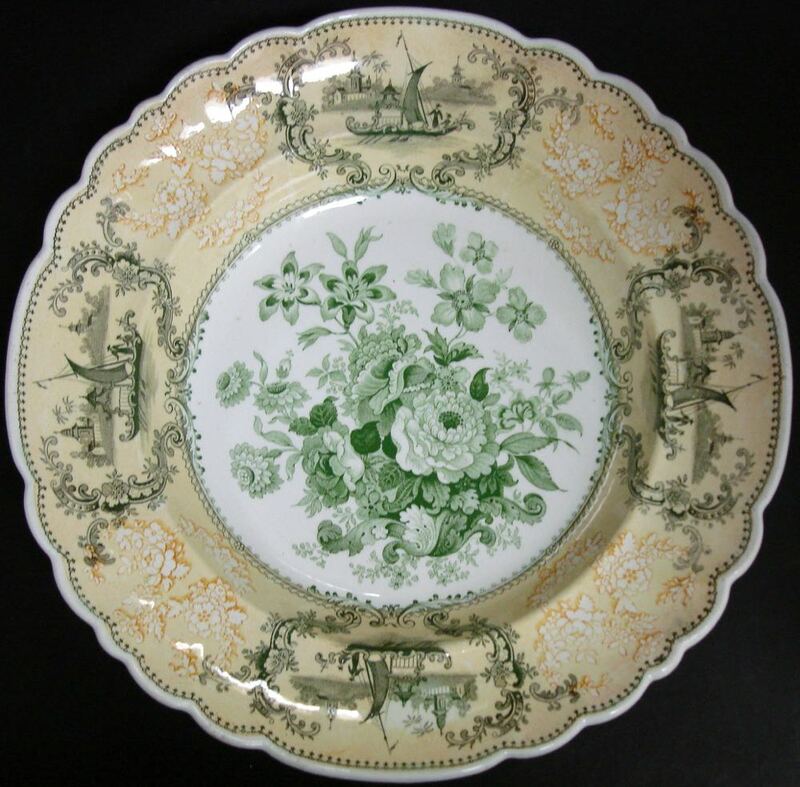 John Meir (1812-1836) "Flora Pattern" 10 inch plate, ca. 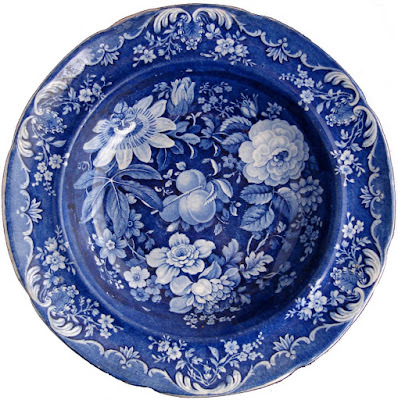 1825. 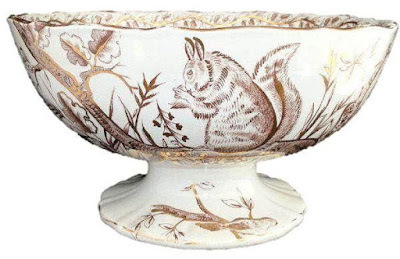 January 21 is National Squirrel Day. As I have mentioned before, there appears to be a national day for almost everything. I love squirrels. (Not so much when they eat my birdseed.) 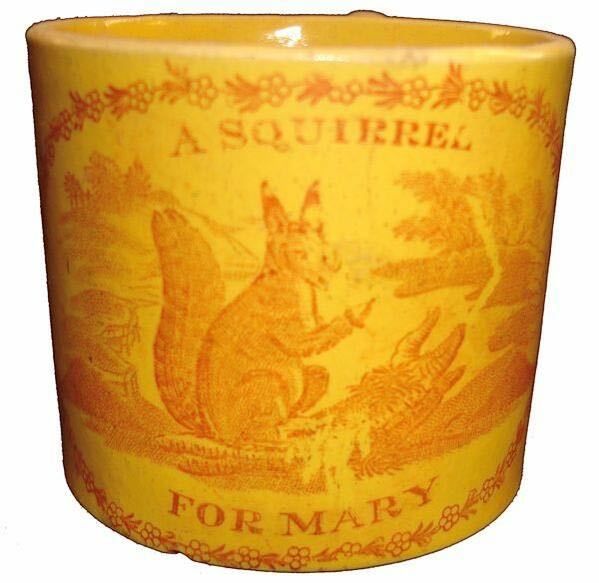 I have written about squirrels before,* so take a look at the links at the bottom of this post. 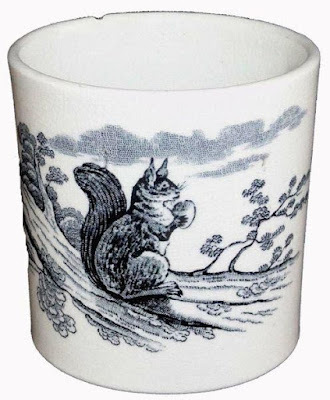 Luckily for me, squirrels were popular transferware patterns, so I have a few more to show you. Remember that the squirrel you see on 19th century English transferware is the Eurasian or British red squirrel, not the interloper who goes by the name of the Eastern or American grey (sometimes gray) squirrel. The print below is the source print for the squirrel in the "Flora Pattern" plate above. It is from the "Cabinet of Quadrupeds" by John Church. 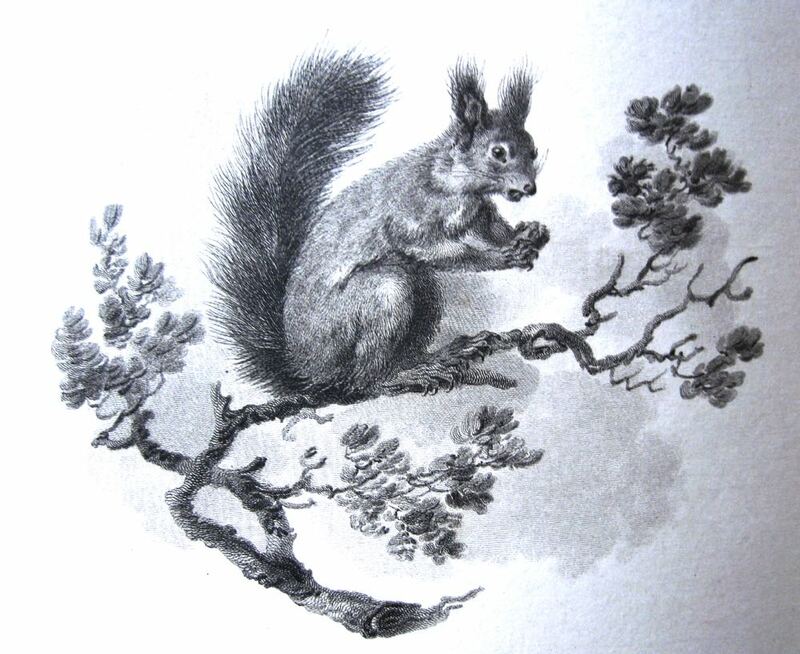 "Common Squirrel" from the "Cabinet of Quadrupeds" by John Church, 1805. This is a red squirrel. 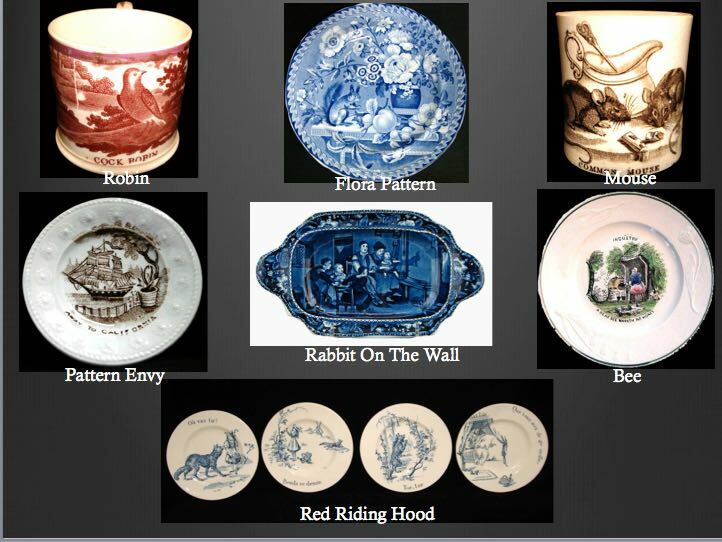 The following patterns are similar to the source print, but were probably not copied from it. This cup may be from a child's tea service. I like the excellent print. Many squirrel patterns appear on children's items. 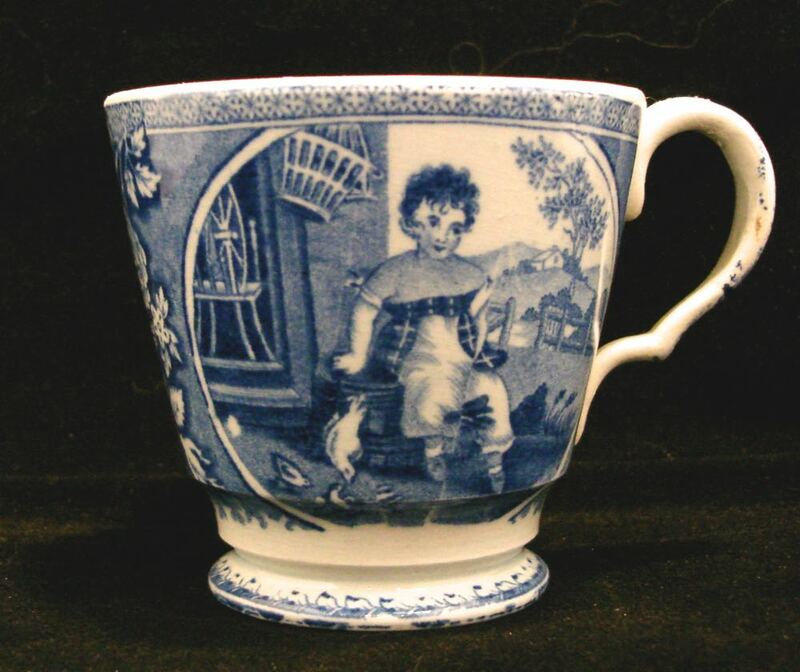 For example, the child's teapot below. 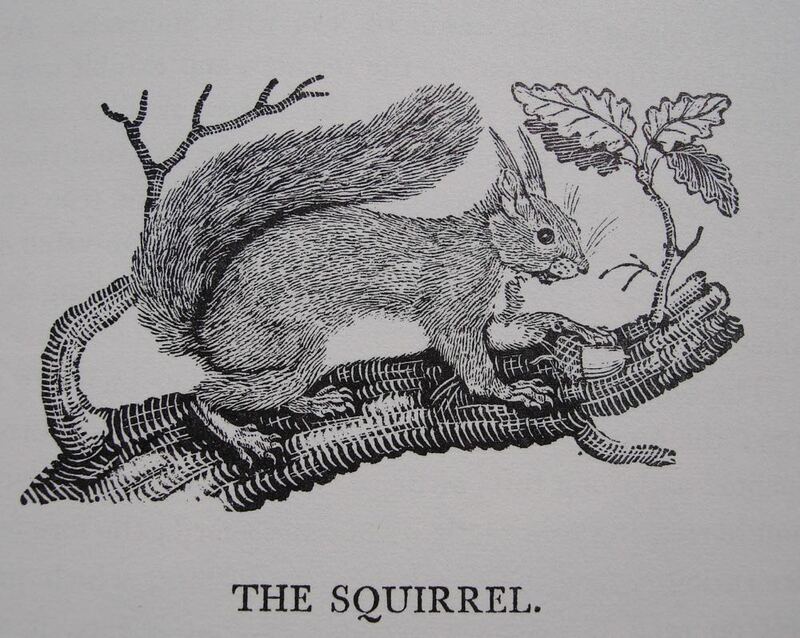 It is printed with a squirrel copied from Thomas Bewick's "The General History Of Quadrupeds," which was first published in 1790. 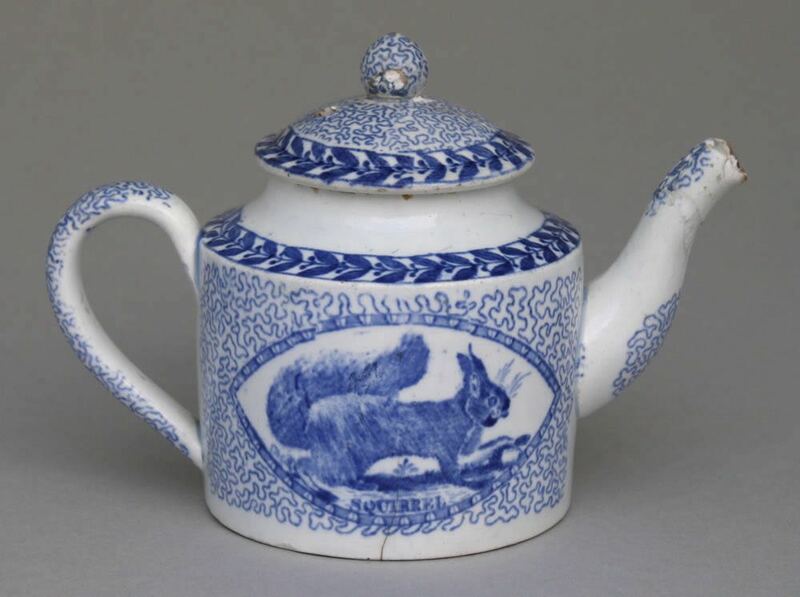 Child's teapot printed with a squirrel copied from Thomas Bewick's "The General History Of Quadrupeds," which was first published in 1790. "The Squirrel" from "The General History of Quadrupeds" by Thomas Bewick. 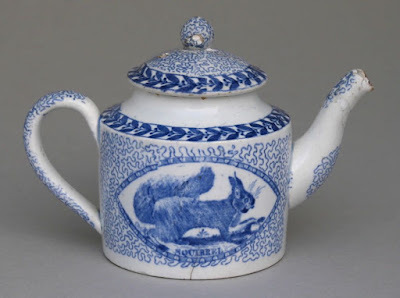 The squirrels below are part of Aesthetic Movement patterns. All, except the child's plate, are on items intended for use by adults. 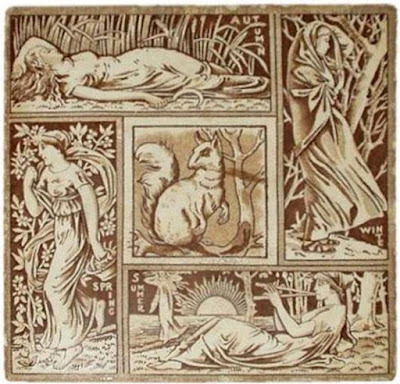 T. & R. Boote (1842-1906) 6 inch by 6 inch tile known as Four Seasons, ca. 1880. David Methven & Sons (1847-1928) "Squirrel" pattern 10.5 inch bowl, ca. 1880. 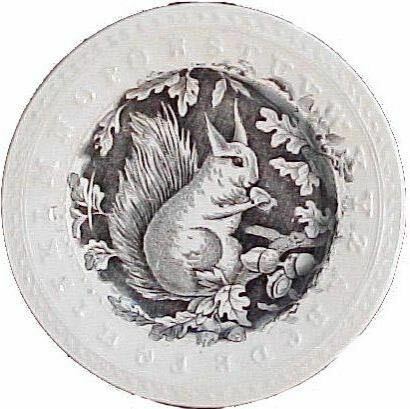 Child's plate with a molded alphabet border, a squirrel, and Aesthetic Movement decoration. 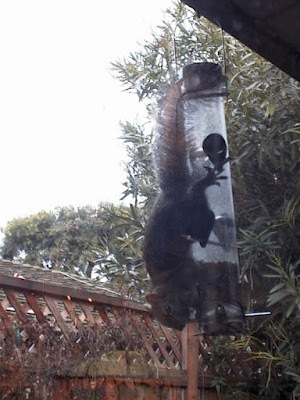 As I said, I do love squirrels, just not the mess they make of my bird feeder! Squirrel on my bird feeder. 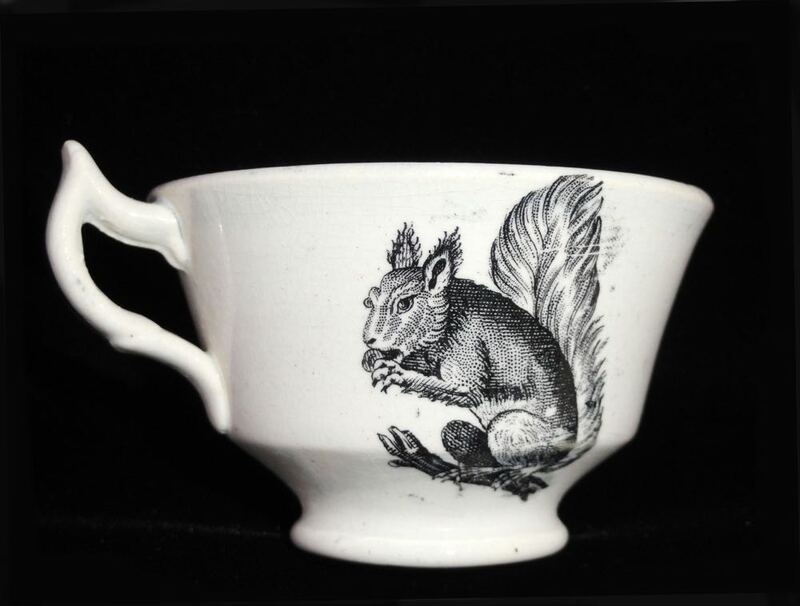 It is an American Grey Squirrel. The squirrel needed to jump onto the roof of my house and shimmy down the feeder in order to steal the food! Cat Merchants? 10 inch plate with a blue spatter border. 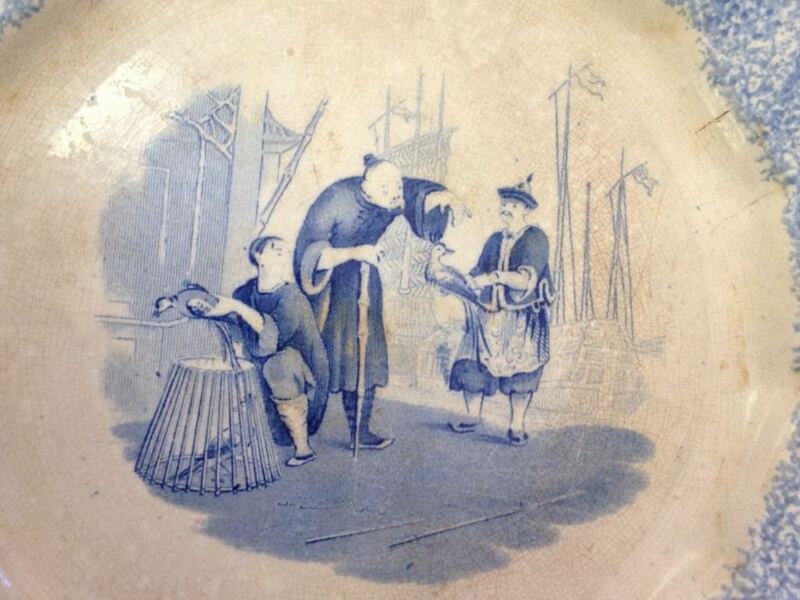 It is hard to tell what the merchants are selling. 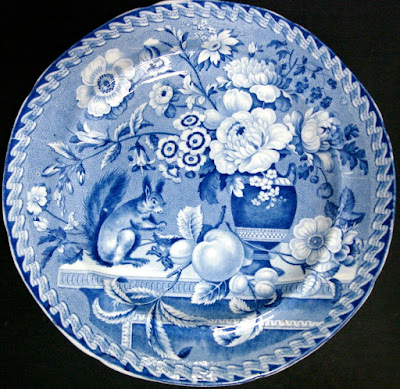 I never thought of cats as food (read the link for more information). I was told their meat was too tough to be good. I was wrong. 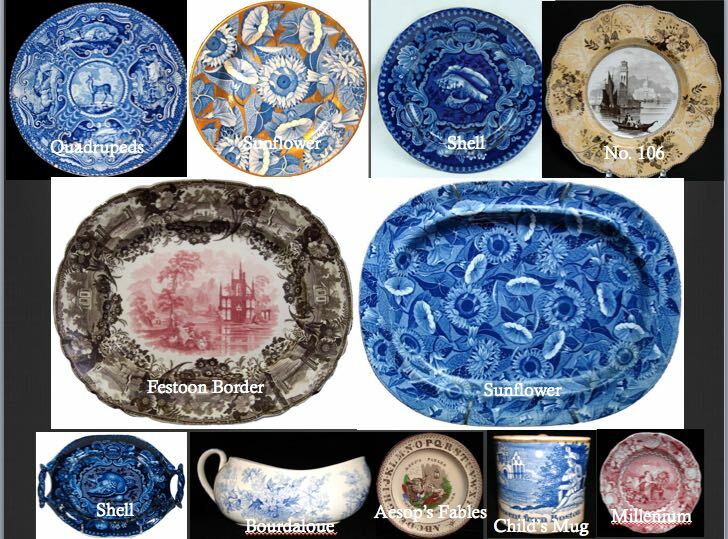 I learned this because a Chinoiserie pattern appeared on eBay that didn't seem to be among the nearly 14,000 patterns in the Database of Patterns and Sources of the Transferware Collectors Club. It turned out that the image in the database was so poor that it was difficult to tell what animals were in the cage and in the hands of the merchants. 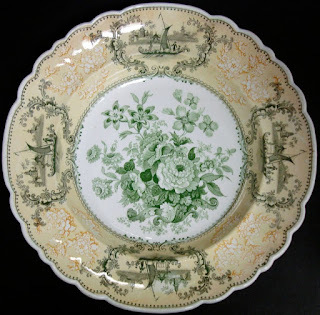 Susan Ferguson, an extraordinary sleuth, found the source print for the pattern. 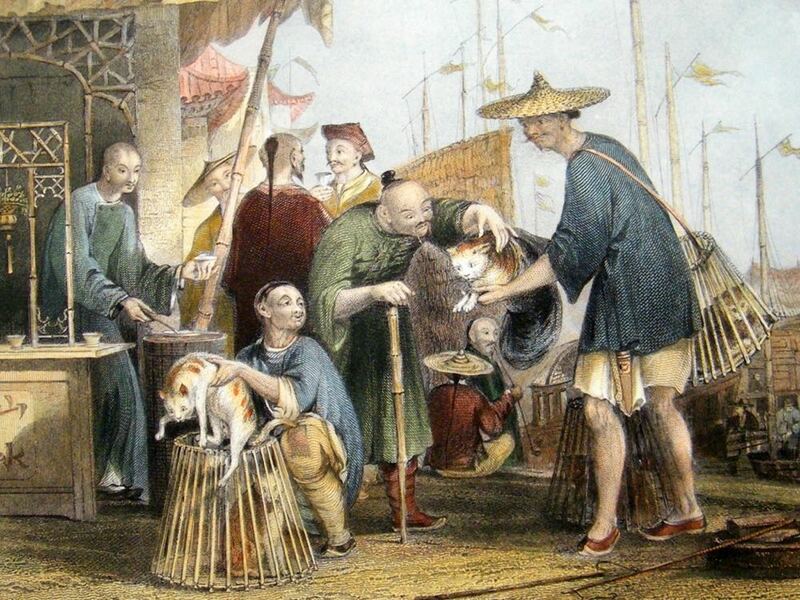 The animals being sold at market were cats! At least on the source print. So the TCC named the pattern "Cat Merchants." Cat Merchants and Tea Dealers at Tong-Chen (The Port of Peking), also known as Chinese Cat Merchants. It was drawn by Thomas Allom, engraved by T.A. 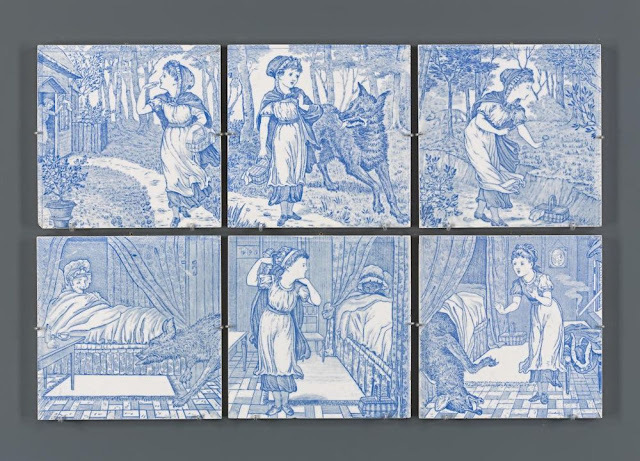 Prior, and is from "China, in a series of views, displaying the scenery, architecture, and social habits, of that ancient empire" by the Rev. G.N. Wright, ca. 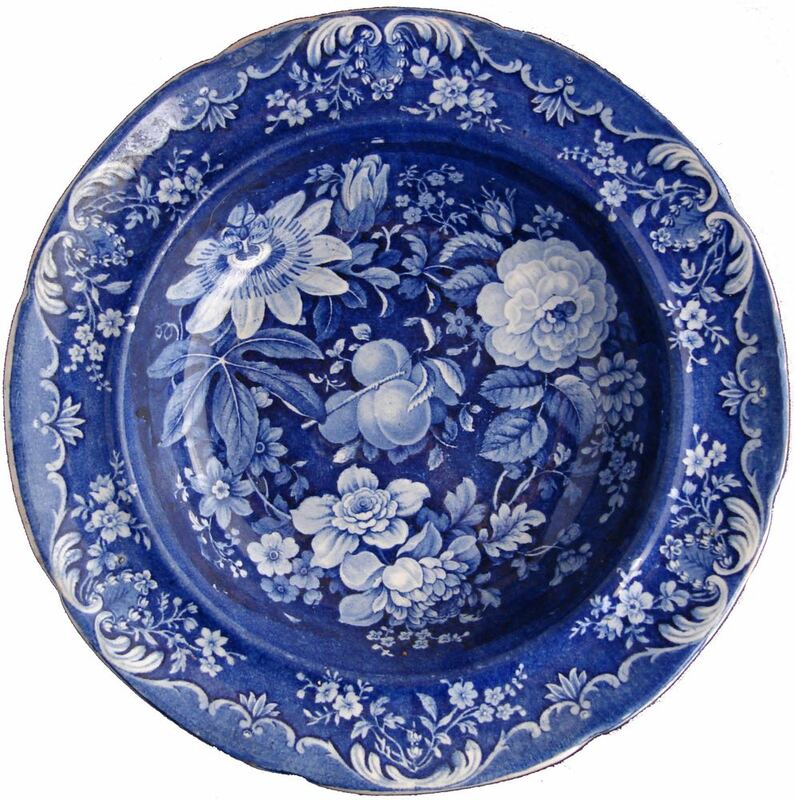 1843. 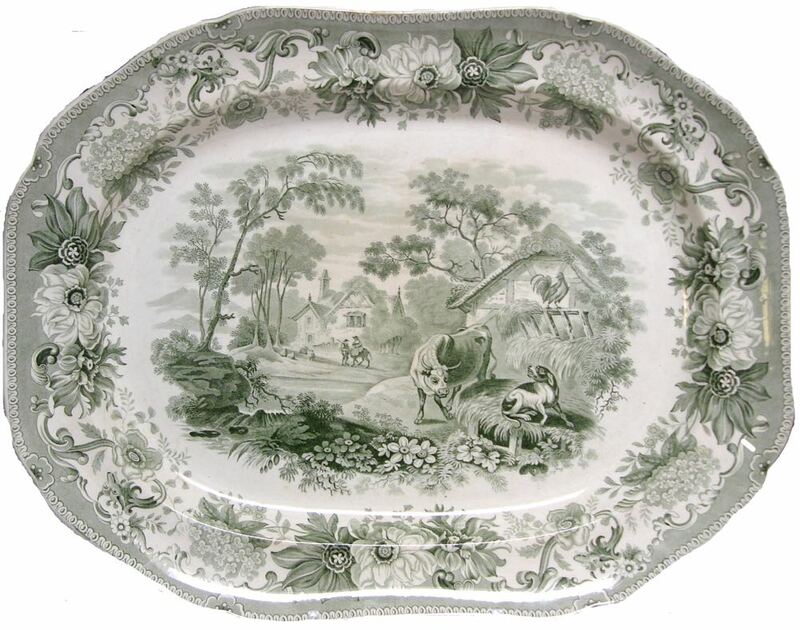 However, the plate on eBay was a clearer print, so I could see that the animals in the pattern were birds! 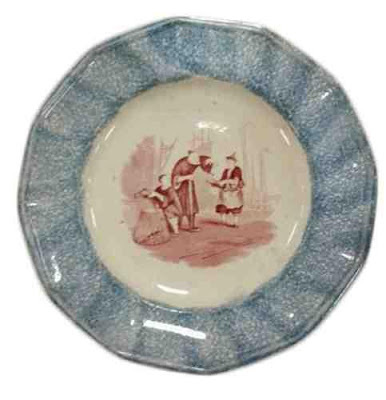 Transferware printed 10 inch plate with a spatter border showing merchants selling birds. 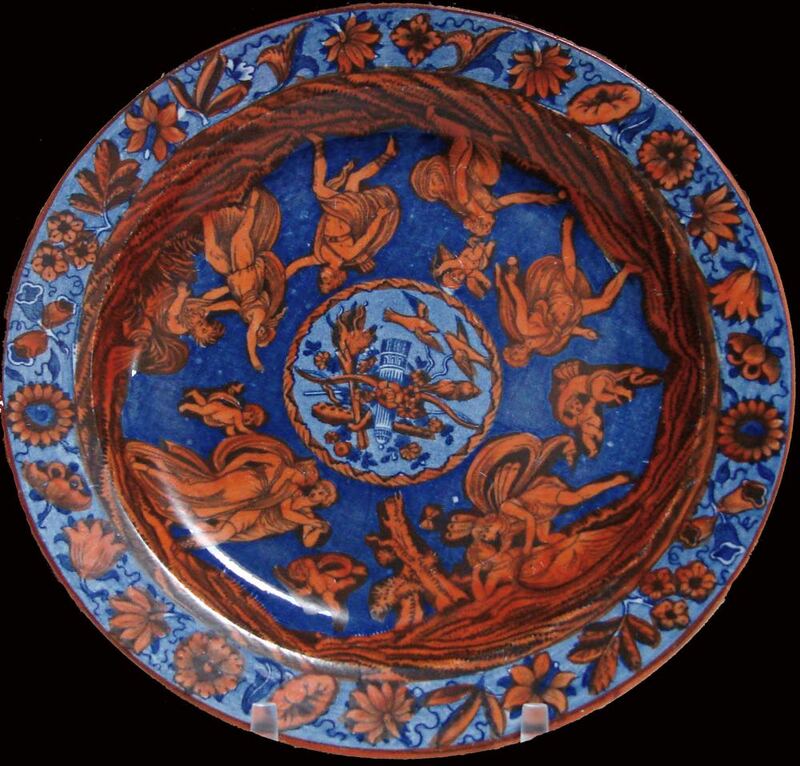 Close-up of the plate above. 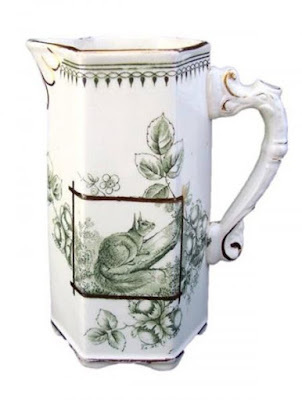 Why the change from cats to birds? 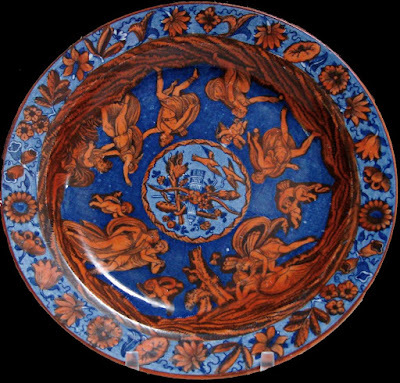 My guess is that selling birds for meat was considered by the potters as a more palatable (forgive the use of the word) pattern for British buyers than cats.